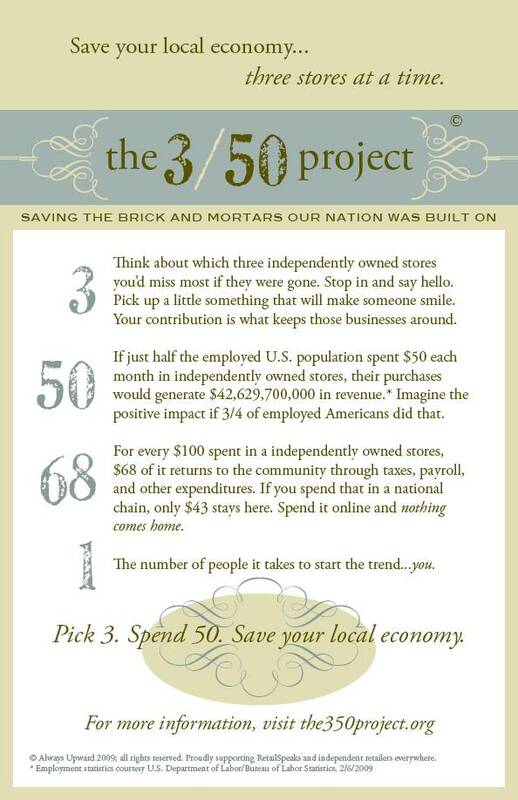 One of my co-hosts of the Locally Grown Radio Show, Tracy Davis, gave me a hand-out yesterday on the 3/50 Project. The effort is kind of nicknamed “save the economy three stores at a time”. The project encourages you to think about which three independently owned businesses you’d miss most if they were gone. Then stop in, say hello, and pick up a little something to make someone else smile, spending at least $50 each month in the independently owned business in our community. The project reminds us that for every $100 we spend in an independently owned store, $68 is reinvested in the community, compared to only $43 in a national chain. So, your $50 per month reinvests $17 in Northfield, and helps to support our local economy.